We’d love your help. Let us know what’s wrong with this preview of Flicker by Rebecca Rode. To ask other readers questions about Flicker, please sign up. I normally don't care for dystopian but I LOVED this book! I was captivated from the first page and I don't think I breathed until I finished. Highly recommend! This Sci-fi could use a little more polishing but was fairly fast-paced and engaging. We have a fairly naive girl caught in the middle of two sides, neither of which seem to be good sides. The concept behind the flickers is fairly original and you do want the MC to prevail. There is a set up for a possible romance, but I wouldn't say it's the focus at all. I think overall this is a tail about overcoming big obstacles and beating evil. I loved this book!! I normally don't read space-related books, but this one was amazing. The idea behind the plot was pretty unique in my opinion. Lots of death and heart break though. I'm intrigued to see where the second book goes with this story! This story is part of the Dominion Rising HUGE package. One of the descriptions for this story says it is perfect for fans of the Wheel of Time series. No, it isn't. There was a scene where the main character wore a collar that allowed someone else to control her. That is the only similarity. This is SF and involves space travel. It was an okay story for me. Too much sweet romance stuff for my taste. I was in the mood for a space opera and I found this in my purchased books on my Kindle. It was a very interesting book - dystopian story set in space, with an Empire at war, and a gypsy element with a main character to can tell fortunes. Except for the Hunger Games-like competition piece, I liked it a lot. Ember, the main character, is from Earth, now a reject planet in a future where space travel is possible. She's also a member of the last true Roma kumpania, though being half-gadjo she doesn' I was in the mood for a space opera and I found this in my purchased books on my Kindle. It was a very interesting book - dystopian story set in space, with an Empire at war, and a gypsy element with a main character to can tell fortunes. Except for the Hunger Games-like competition piece, I liked it a lot. Ember, the main character, is from Earth, now a reject planet in a future where space travel is possible. She's also a member of the last true Roma kumpania, though being half-gadjo she doesn't fit in there. She has a special ability to see the future and read people's memories from the past, and she uses this to support herself and her sick father. But then she gets sold to the Empire, whose only interest in her is weaponizing her power to fight for control of the galaxy. So far, so good, but there are definite cliches. The writing is pretty okay, and there are enough unique elements or unique twists on old ideas that I'm not put off by the recycled material. It reads like YA, though Ember is almost 20. Pretty early in the book Ember is taken from her little village on backwater Earth and sent to military academy to train as a soldier in the Emperor's war. With her ability, they intend to groom her as a special weapon. During training they find that - surprise! - she's even more powerful than they or she originally thought. That was annoying for being so hackneyed, as was her unblinking acceptance of all this new technology. The beginning of the book strongly implied that Earth was a reject, backwoods planet that no one would willingly inhabit. The village she's from didn't seem to have simple amenities like electricity, and yet her she is on a space ship, with all kinds of new technology she's supposed to use and be subjected to in testing, and she doesn't bat an eyelash. I would expect a bit more of a reaction than that. I'm also annoyed at the obvious romantic setup between her and Stefan. The obligatory roadblock is that she has this stupid idea she's going to marry a Roma man, even though a) she's an outcast in her kumpania because of her outsider dad, and b) she goes over the roster of eligible bachelor's early in the book and there are none. In spite of that, she stubbornly clings to this idea that she MUST marry a Roma. Aside from these glaring obstacles, the intent that she and Stefan are intended for each other by the author is so in your face painfully obvious that it's cringe-worthy. If it had been allowed to develop naturally I could have seen it, but as it is I'm just irritated. The Pavlov conditioning with Commander Kane is totally unbelievable. The leverage of her family and village seems to weigh much heavier in Ember's mind than pain, and is therefore far more convincing. Plus, at just the right moment, she suddenly finds the strength to throw off the pain and push through Commander Kane's power and break free. Really? Seems like too little, too late, and much too convenient when she finally triumphed. By the end, I was torn. I like the setting, the "flicker" ability, and the political struggle, especially since by the end of the book, it's not obvious which side is the good guys, if there are good guys in this conflict. I disliked how quickly Ember gave up her reservations about Stefan. Though her idea of marrying a Roma was stupid, we were pounded over the head that SHE WOULD DO IT. For her to suddenly drop it because she met a cute guy seemed quite ridiculous. The whole romance with Stefan went so fast it was almost nonexistent, and that bothered me, too. This is a short book, both in pages and internal chronology, and a lot of things felt rushed. ‘The only person you are destined to become is the person you decide to be’. Ember is half Roma, and she tries to make a living from the tourists who visit Earth. Humanity has fled and expanded over the Galaxy, and only the Roma were left behind. One day her village receives the visit of a ship of the Empire, and some soldiers seem to take interest in Ember’s special powers. They decide to take her with them and use her as a weapon, but she has just one thing in mind: going back home to take care of her sick father. This book trapped me from the start due to beautifully developed characters and an interesting story. The characters are well defined, and the dialogs rich and natural. Ember is a strong and independent woman, who has everything to change the course of things, but she has her ideas clear and doesn’t loose focus. She knows what is important in life and doesn’t get distracted by shiny things. Another detail that made this book very appealing was the world building. It seems there is an ongoing war between the Empire and the Union, a war in which the Roma didn’t take part. Everyone around Ember affirms that the Empire should win this war, but it is not clear to her why this should be the winning side. The people from the Union are evil, everybody knows this, but nobody can give any details about it. Ember’s main goal is going back home to take care of her father, but she gets mixed in something bigger. There is a lot of action in this book but, as said, also great characters. The most amazing events are empty without characters I don’t care for. I cared dearly about Ember and her companions, and suffered along with them. If a book can do this to me, I consider it a complete success. Stacey Glemboski has become one of my favorite narrators. I had the pleasure of listening to her in another audiobook recently and I was glad to be able to enjoy her voice again. She has wonderful interpretation skills, transmitting the characters’ emotions like if you were listening to them. Her voice range is quite ample, and her male voices are realistic and quite good. I loved LOVED this audiobook, and I do hope the next one gets released soon, so that the questions about the Empire and the Union get answered. It seems I can’t get enough of Ember’s story and Glemboski’s voice. I would recommend it to anyone into science-fiction and who enjoys great characters. This was so good, I already want to read book 2! This is a concise adventure tale that will entertain you well for a few hours. Before this book, I had never read or heard anything from Rebecca Rode, but that may be my last. The story begins with Ember, a young Roma woman of 19 years, telling fortunes to tourists who visit an abandoned Earth. Telling a fortune to a special military recruit kicks off a series of events that goes throughout the story and doesn't give up. Ember is kidnapped and force This was so good, I already want to read book 2! Ember is kidnapped and forced into military service, but she never strays from her own moral compass. Her greatest desire is to go back home to her village and take care of her dying father, and she will risk everything to do that. Along the way, she defies those in power over her, however foolishly, because she will not be a pawn or tool in their games of war. I would expect at least a trilogy out of this, and Ember is an interesting enough character that I would follow her to other stories. Her character and adventure would appeal to those of any age who like resourceful heroes and space-faring adventures. The narration was excellent. The characters were consistently portrayed so I never had to wonder who was speaking, and the narrator's voice is pleasant. The sound of the audio itself was crisp and clear, creating an inviting listening experience. Ce livre est une très bonne introduction à un nouvel univers et j’espère vraiment que l’auteure l’explorera plus à fond dans le prochain. Les personnages sont intéressants, même si l’héroïne leur fait tous de l’ombre, et j’espère que nous aurons une chance de vraiment les connaître. Pour ceux qui s’inquiètent de l’aspect science-fiction, il n’est pas très présent, sauf pour une technologie très basique que nous voyons beaucoup dans d’autres séries/livres. J’ai hâte de voir les prochaines aventures d’Ember. This book is a very good introduction to a new universe and I really hope the author will explore it more thoroughly in the next one. The characters are interesting even though the heroine really shadows them all, and I’m hoping we’ll get a chance to really get to know them. For those worrying about the sci-fi aspect, it’s not really present, except for some basic technology that we saw in a lot of other shows/books. I’m looking forward to Ember’s next adventures. Ember is everything you could want in a lead female character. She's determined, resourceful, caring and willing to fight for what she believes in. It's just as well, because the odds are stacked against her and everyone seems to want something from her. The plot is unique and never went where I was expecting it to and it left me desperate to know what is going to happen next because there are so many possibilities. The future setting involving races from multiple planets who have all intermarried Ember is everything you could want in a lead female character. She's determined, resourceful, caring and willing to fight for what she believes in. It's just as well, because the odds are stacked against her and everyone seems to want something from her. The future setting involving races from multiple planets who have all intermarried and interbreed creates lots of room for creativity as far as characters are concerned and that's definitely taken advantage of. The narration is first class, Stacey amazes me every time I listen to her with the quality of her character voices, I think she's one of the best in the business. the pace and tone of her delivery also helped to build the tension in the story. Mankind has left Earth and settled the stars and is now governed by a central body led by the Emperor but all is not well in the settled planets as a war is being fought between two factions. Amongst all this is Ember, a child gifted with the ability to see the past, present and future of any individual she chooses to read. She is not alone with this gift, there are many others from countless planets and they are known as Flickers. Normally, they are identified at an early age and trained to be p Mankind has left Earth and settled the stars and is now governed by a central body led by the Emperor but all is not well in the settled planets as a war is being fought between two factions. Amongst all this is Ember, a child gifted with the ability to see the past, present and future of any individual she chooses to read. She is not alone with this gift, there are many others from countless planets and they are known as Flickers. Normally, they are identified at an early age and trained to be part of the emperors forces, being fitted into one of many roles in the fight against Union. A chance meeeting with Stefan and a reading that she gives him, thrusts her into the limelight of the emperors soldiers and soon she is kidnapped from the world and life that she struggles in to become the pawn in a battle that she wants no part in yet cannot escape. Flicker by Rebecca Rhodes is a dystopian tale beyond the stars. Ember is a Rom, but known as a gypsy to every person she meets, who can’t be bothered to know the difference. She is kidnapped from her home and discovers others with a power like hers. This special gift is being trained and used by the military to take out the enemies of the empire. Ember holds a special gift that separates her from those with powers. 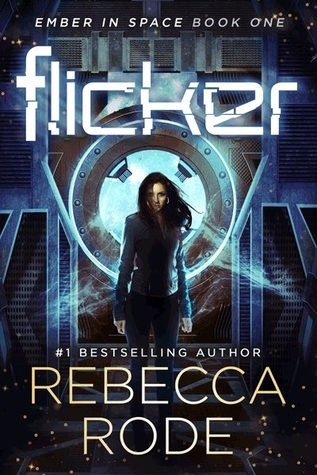 She embarks on a journey to decide who she is and what she is willing to do for th Flicker by Rebecca Rhodes is a dystopian tale beyond the stars. Ember holds a special gift that separates her from those with powers. She embarks on a journey to decide who she is and what she is willing to do for those she loves. The story is fast paced, and an immersive read. I found myself getting lost in the world, and wanting to explore it further. I would love to read more about the past as well, with a prequel about Ember’s father. This story is fantastic for fans of science fiction, dystopian societies, and psychic powers. I feel like fans of Firefly would enjoy this book. I look forward to the next book in the series, and want to read more of Rebecca Rhode’s work. From the sublime to the stock, we move from an Octavia Butler novel to Rebecca Rode's Flicker, the first novel in her Ember in Space trilogy. If you are looking for a good book, this ain't it. If you are looking for a really fun, easy, beach read, then this is perfect. Flicker is predictable in almost every way. There was really only one thing that surprised me, and that was almost marginal. What you have here is story, story, story. Even so, the main character is fun, even empathetic. There is a main character who is just evil. There is absolutely no shading between good and evil. And there is the discovering of a new power, how to use it, and it's limits. As stated at the start, very stock. Even so, it is a fun, quick read, a great though very predictable diversion. I'll give it 4 stars for being fun, perfect in its genre. I'd give this 3.5 stars. It's science fiction set sometime in the distant future when most of humanity has left befouled Earth. Those left behind are the Roma, or gypsies, who were denied passage in the exodus. The Empire rules everywhere, with the Union, led by the Emperor's Daughter, fighting to take it down. The first in a series, Roma fortune teller Ember tells fortunes whenever a tourist ship lands and cares for her ailing father at night. She is kidnapped by the Empire to be trained and use I'd give this 3.5 stars. It's science fiction set sometime in the distant future when most of humanity has left befouled Earth. Those left behind are the Roma, or gypsies, who were denied passage in the exodus. The Empire rules everywhere, with the Union, led by the Emperor's Daughter, fighting to take it down. The first in a series, Roma fortune teller Ember tells fortunes whenever a tourist ship lands and cares for her ailing father at night. She is kidnapped by the Empire to be trained and used as a psychic weapon when her fortune telling skills hint at greater abilities. Colonel Kane plans to use her to win the war against the Union and set himself up to be Emperor. I really loved this. It would be a great read for a teen or adult. Very clean but with violence. No profanity that I can recall. Definitely interested in where the story goes. The characters are believable & you care for them. Of course there’s the evil ones you don’t care for either. Ember is a seer and stolen away to be a flicker but soon realizes she is a flame.... she hold life or death in her ‘hands’ through her mind. She has a huge heart and is being used for evil. Can’t wait to start I really loved this. It would be a great read for a teen or adult. Very clean but with violence. No profanity that I can recall. Definitely interested in where the story goes. The characters are believable & you care for them. Of course there’s the evil ones you don’t care for either. Can’t wait to start the next book in a few days! Well written story. It seems as if the character is stuck on a particular course of action for a while, but it is really a short time and it makes complete sense considering now she was raised. Sadly, there are people willing to step on others to get what they want, even when they already have so much. Ember matures during the story and I think the rest of her universe had better watch out, as she is turning out to be a catalyst for change. Ember lives two life’s, caring for her sick father at night and a Roma future-teller by day. Ember’s father is slowly and now she’s about to be forced into a life she never wanted, for being more concerned about taking care of her father. But when the government kidnaps her in the middle of the night, she must learn what a flicker really is. Not every soldier is on board with what is transpiring, though. Training is about to begin and Ember is definitely at a disadvantage. Will her duty to her fa Ember lives two life’s, caring for her sick father at night and a Roma future-teller by day. Ember’s father is slowly and now she’s about to be forced into a life she never wanted, for being more concerned about taking care of her father. I loved our protagonist from the very first page! Flicker is the story of Ember, a gypsy girl (Ooops, I meant to say "Roma") with some amazing magical abilities... and the empire wants her to be their own secret weapon/assassin... Ember just wants to be left alone, and not become a pawn in the Empire's war! As it happens, Ember's abilities are also wanted by the opposition, so she's stuck between the proverbial rock and a hard place! I listened to the audio version of thi This story is awesome! This is for the Audiobook version. Stacey Glemboski does an excellent job narrating the book. Overall I liked the story. It had enough action to keep me interested. The main character, Ember, is abused quite a bit and put into some very difficult situations. Commander Kane, the Villain, is evil and powerful and uses that to get what he wants. I enjoyed their interactions. This book has some interesting premises but the author does not develop an intriguing story. The characters do not engage me and I didn't feel compelled to finish the novel. Plus the villain is truly odious, sadistic, vengeful and bloodthirsty. Even though the story has once again a heroine with super abilities not trained to use them by her ignorant parents, the rest if the story is fresh and original. Placed in no win situation and being responsible for numerous lives made the main character quite sympathetic. The romance is not angsty and is good it was there. Otherwise it would have been very depressing. I will certainly read next installment. A dark dystopian story about a young lady with a special ability to read a person’s past, present, and future. A war is brewing and having someone with Ember’s abilities could turn the tide for either side. She is tested beyond emotional belief but she has a few surprises of her own. This is a very good story with strong characters, plot, and storyline. The narrator also did an excellent job! The bad guys in this story seem a little over the top evil but I liked the character development of the main character and some of the others around her. Raised in a very traditional society, we get to see her eventually find some inner strength and make a stand against that evil. I'm always a sucker for the underdog with nothing left to lose getting pushed to the limits of their tolerance. There's nothing better than the classic gritty good vs. evil fight. Counting down days until the sequel! Ember was a fabulous character. I loved her loyalty to home and her smart and determined way of navigating everything that was thrown at her. Of course, I was hooked as soon as we saw a glimpse of her future. And I enjoyed feeling completely immersed in the two contrasting settings of Roma and space. Great read for those who like fantasy/sci fi with a delightful dose of romance! I liked this book so much that I am going to buy the next one in the series. Being able to see into someone's past and/or future is a fairly common premise,but this one is particularly well written. The characters are interesting and the setting is clearly imagined. This was a read in one sitting book for me, because there was no way I was going to put it down until I read every single page. Ember refuses to conform and repeatedly pays the price. It was easy to envision the world around Ember and the characters are all well written. This is going to be a good series. I was really impressed with the concept of this novel. Rebecca Rode has created an endearing heroine in Ember, and has given the surrounding characters a rich depth with a good back story. So far I think this is the best book as part of the Dominion Rising Anthology. This is book 1 of 3, and I am definitely going to read the next 2 books. REBECCA RODE is the USA Today and Wall Street Journal bestselling author of the Numbers Game trilogy, the Ember in Space series, and numerous novellas. She is also a freelance journalist. She has four children, two cats, one husband, and a ridiculous number of books. Visit her at www.AuthorRebeccaRode.com.